The Disk Jockey, commonly shortened as “DJ”, many may have forgotten that in the past­—specifically in the 1960s—we would know them merely as someone who works behind a radio broadcast table, selecting and playing recorded songs, with their role as the bridge between artists and listeners. Now, after a journey of almost 50 years, it would seem a DJ is no longer solely identified with broadcast radio activities. We may see them as ‘stationed’ behind a table, but they are no longer limited to closed, cold and narrow spaces, separated by distance from their listeners. Nowadays, DJs had even become main attractions at music performances; from night clubs with hundred-person capacities, to open fields welcoming thousands, bringing forth nights unforgettable to most all of their enthusiastic listeners. What change is happening here? Can we say now that DJs are artists, as how one would look at instrumental musicians or music composers? To answer the above question and try to arrive at a conclusion, it would be a good idea to first question the true meaning of a DJ, at least for their direct practitioners: Benji B and JD Twitch. Two DJs from the British mainland. JD Twitch—full name Keith McIvor—is from Glasgow, Scotland. While Benji is a native Londoner. ” I don’t think DJ-ing is rocket science..”, Benji answers. “…and I think all DJs need to remember that they’re playing other people’s music for the most part. So I think DJ-ing is simply a way to try and communicate your musical message to as many people as possible through the medium of playing musical records, or files, or whatever, where actually DJ-ing to me is the art of selection.” He adds. From these two short statements it is implied that what Benji and JD Twitch believes fully as a DJ, is certainly based upon two background realities, the first which is commerciality (not in a negative sense) and the second, creativity. Taking advantage of a collection recorded music (recorded and printed in the forms of vinyl records, CDs, or MP3s), combining them into a new, linear collection of music or sounds (what is commonly known by the term ‘mixtape’) a DJ is almost certainly going to always be dependent upon the medium of music recordings, which is an important element within the framework of music commercialization. And when we stand and move forward from the structure of a music industry supply chain, then more or less I can map where the DJ stands within that. Simply put, if a DJ exists after the recording of music, then can we not say that they stand in the level of the intermediary—as a bridge between the artist (musicians, composers, producers, etc.) and the listeners—or they can be said to be at the level of demand, as listeners? If this is so, then they the listeners can also be said to be like DJs in their radio broadcast activities as had been described at the beginning of this article. But reflecting on this reality, can we say any longer, is it still true and valid that DJs are not artists? And if when I say yes they’re not, then why is DJ-ing currently being treated as a new form of art? And there is one more important aspect that we have not discussed, which is about creativity. With the background of Benji B’s statement, that DJ-ing is the art of selection, I argue that DJ-ing must also have a clear set of rules and objectivities, as is the way with other arts. Of course in addition to having adequate technical aspects—such as beat-matching, cross-fading, chopping, etc.—the creative element, in addition to comprehension of one’s surrounding contexts, this creative context is something that is inseparable from a DJ; especially for those who are firm in their belief that DJ-ing is a responsible artistic achievement. Names such as DJ Kool Herc, DJ Shadow, Larry Levan (the three of them from USA), DJ Krush (Japan), DJ Dolores (Brazil), Francois Kevorkian (France), and others, they have all long proven it. “It is an art form and it does have to be respected as such, as something that you can only do with a certain degree of experience, and I think that the lineage of the different styles of DJ-ing would prove that people can, you know, express a different experience in a different way.” Benji continues. So far, there are two argument subjects interesting to observe. The first, that DJs—from the viewpoint of commerciality—does not lie within the same area as artists. Then the second, DJ-ing—from the point of view of creativity—is now considered a responsible artistic achievement. Then the question now is, must a work containing artistic values be produced solely by an artist or a group of artists? “Fundamentally it is about entertaining people and in that sense can appear to be a very disposable ‘art form’ as it is often but a fleeting memory for the people who have experienced it. But, a DJ set can also be a thing of great beauty that can deeply touch an audience. Often this is due to a perfect synergy of performance, audience, space, mood and the moment. All these factors being perfectly synchronised can lead to a temporary zone of complete transcendence which cannot be pre planned but is rather a very spontaneous thing.” Thus JD Twitch gives his opinion on DJ-ing as an art form. JD Twitch is a DJ who had conducted his DJ-ing career for over 25 years, and as an initiator and organizer of his weekly program—with partner JG Wilkes—which they named “Optimo Espacio” for over 10 years, they of course quite understand the DJ-ing world and its dynamics. And from his words we can glean at least a partial image that the perception of DJ in the eye of society are also varied. “It is different things to different people. For many people it is just a background soundtrack to their hedonistic or mating behaviour. For others it is an opportunity to escape the rigorous and problems of day to day life while for others it is their temple, a place where they completely lose themselves for a few hours and enter some sort of anarchic ritual,” he adds. Of course with differing location there is also differing situation. It depends on the socio-cultural aspects of each region, and with different artistic approaches as well. Starting from Jamaica in the 1960s with a set consisting of a DJ, selector, MC, and a sound system tweaker all of them at an open outdoor field, with the purpose of proclaiming and spreading the sounds of freedom. At the United States during the 1970s up to the end of the 1980s, DJs were a spearhead for the struggle of minorities against discrimination happening within society. Some figureheads who were born in that era among them are Larry Levan (popular in the New York disco scene), DJ Cool Herc (as the initiator of Hip Hop at South Bronx), then Franke Knuckles (House Music in Chicago), and Derrick May (Techno Music in Detroit). In Europe herself, it was England with their massive rave parties in the 1990s as a response to hooliganism, and continuing to the birth of Drum n’ Bass, and Germany with their Love Parade as the expression of their youth, in addition to Italy, France and Spain. In their journey, the DJ-ing world was still dominated by the nations just named. Perhaps in Asia, it is only Japan who had been able to make a sound in the world level, with people such as Daisuke Tanabe and DJ Krush. But when we trace back, DJs with their tools—turntables, CDJ, mixer, speaker, vinyl plates, up to the MP3 format more popular currently—they all were born from technological developments, a pillar for the birth of the industrial revolution which happened in the West at the end of the 19th century. 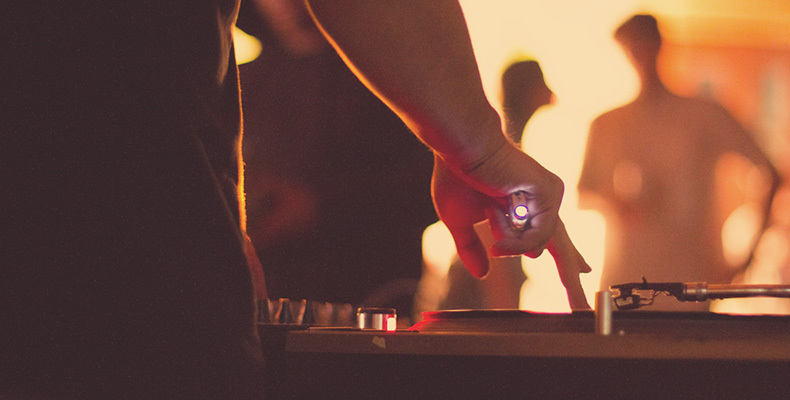 In other words, DJing was born driven by developments in technology. And this may answer the debate regarding the artistic status of a DJ in comparison to, say a musician or a composer (specifically during said era); it is the musicians and composers who had driven the development of sound technology, starting from the musical instruments (such as the piano, guitar, percussion, synthesizers), up to the recording media and formats (such as the gramophone, amplifier, microphone, recording tape, vinyl plates, CD, and MP3). And from that point of view, of course I can answer that the artistic level of DJing is not the same as that of a musician or composer. With the note that there are also a number of musicians and composers who did not successfully fulfill their artistic roles and functions. That if then afterwards a DJ would have a role as the builders and guardians of values present in society—especially within urban society—as if like an artist, of course this reality too cannot be denied. Honestly, I myself as a member of urban society, and as a musician as well, I am one of those who grew up and was inspired by the DJ-ing world. And also to answer whether or not a work with artistic value must originate from among artists, I feel this is not so. Once again, several or perhaps even hundreds of DJs have proven it plenty. A warehouse of proof is even visible outside of the music world around us, starting from fashion stylists, interior consultants, even weapon makers. And so if we return to the term DJ or Disc Jockey itself, we could already see clearly the answer. A Jockey, as a term in the English language, means a person which operates something. Within the context of Disc Jockey, this then means a person who operates discs of music. No more, and no less. Taking note of the reality of the DJ term as it is used to this second, then in my opinion a DJ at the core is still a Disc Jockey; not a musician, not a composer. And with their role and function today for society at large, as well as with artistic approaches for the development of music itself, then the DJ becomes no lower or higher than a musician or composer anywhere. ” I’m not so sure I want to call myself a DJ, I just want to play—I’m just a guy who plays music. That’s it. I mean like a DJ, it’s such a technical term doing like, mixes and everything,” Benji states. “I think being a DJ actually is you have to be a great selector. They play with an emotion and how you build that emotion, I believe. I don’t know if I’m at that level yet but I’m still trying to learn more and more, but… I mean that’s the only thing, the only reason why I want to be a DJ,” he closes. DJ: The future way of looking at the music scene? At this moment, the world is still searching for a new music form, through various methods and efforts. Through the DJ-ing world movement in the 1970s-1980s, music in the world experienced change, especially as what happened in the area of dance music and popular music, until it again dimmed at the beginning of the 21st century. On the other hand, technological developments happening at various levels of life feels more festive but at the same time constrictive. Especially in the DJ-ing area of today, technological developments goes on as if challenging the actors within to continue their exploration for the creation of other new possibilities. Did it work? If we look at the music format and style presented in the past decade, we can say that many are still similar with repetitive forms and constant metre (4/4), such as house music, disco, techno, or even Hip Hop as had been done by their predecessors. Can we then say that developments in technology can become motors for the creation of new music? ” I think there are many ways of looking at it. The so called underground scene will always exist alongside and out with the commercial mainstream. In all honesty, what happens in clubs, apart from technological advances, hasn’t really changed very much in the 25 years I have been doing this,” answers JD Twitch, which also gives a picture that it is the individuals, or artists, who must become the driving force for the development of music itself.